The Goberdhan group benefits from the collaborative opportunities both within the Department of Physiology, Anatomy and Genetics and the wider University. In addition to weekly group discussions, we meet on a monthly basis with clinical scientists and other groups working in overlapping research areas: contributing to plans to exploit the translational implications of our work and generate new research avenues. We are interested in intracellular signalling and cell communication. Our major focus is on how this goes wrong in cancer and other major human diseases. Work from our group has contributed to the establishment of intracellular amino acid transporters or solute carriers (SLCs) as amino acid-stimulated receptors or ‘transceptors’, which connect amino acid levels to the activation of the microenvironmental sensor mechanistic Target of Rapamycin (mTORC1) to control cell growth and metabolism, as illustrated in Figure 1 (see foot of the page). This link emerged from our molecular genetic analysis of the Proton-assisted amino acid transporter (PAT or SLC36) family, initially in flies. It was followed up by studies, over more than a decade, of the molecular mechanisms linking the PATs to mTORC1 in human cancer cell lines and patient samples, in collaboration with Prof Adrian Harris. Our interest in cell communication has developed to include the cross talk between cells involving extracellular vesicles known as exosomes, which are released from cells and have emerged as important players in cancer progression (Figure 2 - see foot of the page). Our work on exosome signalling involves complementary studies using human cancer cell lines and also employing an in vivo fly model of exosome secretion that we have developed in collaboration with Prof Clive Wilson. Current work in the group can be divided into three broad aims. Our first aim is to understand the role of amino acid sensing and stress-induced signalling in regulating cellular growth and intercellular communication involving exosomes. Much of our work has been on colorectal cancer, for example, focusing on the effect of glutamine depletion and reduced mTORC1 signalling on HCT116 colorectal cancer cells. We are assessing the effect of these stress signals on the content of secreted exosomes using proteomic analysis in collaboration with Dr Roman Fischer and Nanostring analysis of miRNAs in collaboration with Prof Tudor Fulga. Other research in the group is focused on prostate cancer, where we have been analyzing the role of human PAT4 and its effects on cell growth and exosome signalling, through a collaboration with Mr Richard Bryant, Prof Clare Verrill, and Prof Freddie Hamdy. We are also analyzing the effect of microenvironmental stress on a panel of breast cancer cell lines in collaboration with Dr Imre Mager in Prof Matthew Wood’s group. The second aim of the group is to investigate the regulation of exosome formation and heterogeneity by intracellular signalling pathways and membrane trafficking. For example, we are studying the roles of the small Rab GTPases and ESCRTs in controlling different populations of exosomes in both human and fly cell models by combining genetic analysis with advanced microscopy methodologies in living cells, including super resolution 3D-SIM, in collaboration with Micron Oxford. This analysis builds on several leads that have come out of our proteomic analysis of human exosome cargos. We are also investigating changes in the protein and phospho-protein profile of exosome-secreting cells to unravel the molecular mechanisms underlying the release of different exosome sub-types. Fractionation of exosome populations using size-exclusion chromatography is complementing the analysis of exosomes isolated by ultracentrifugation and helping to shed light on exosome heterogeneity. This is being followed up by electron microscopy analysis of extracellular vesicles with both Prof John Morris and Dr Errin Johnson. Further insights from the genetic analysis of our fly model concerning exosome heterogeneity are being pursued in several cancer cell lines. Our third aim is to analyse the effect of exosome signalling on recipient cell behaviour and cancer progression, particularly in response to microenvironmental stresses applied to exosome-secreting cells. Analysis of exosome function on target cell behaviour has been facilitated by the group’s IncuCyte live cell imager, used to assess a range of cell properties related to cancer progression, including cell proliferation and migration, apoptosis and blood vessel formation. We plan to apply our findings to patient samples through our clinical collaborations with Mr Chris Cunningham. Work in the group is supported by a Cancer Research UK Programme grant to investigate how exosome signalling is controlled by the microenvironmental sensor mTORC1 and the implications for cancer progression. The group has also attracted several DPhil students, who have won competitive awards to support their studies: these come from a range of backgrounds, including surgeons, who are interested in becoming clinician scientists. We have secured internal funds from the Cancer Research UK Oxford Centre to develop collaborative links and the John Fell Fund coupled with Departmental support to purchase state-of-the-art equipment. BBSRC support is enabling us to analyse the changes in cellular trafficking leading to exosome heterogeneity. Our work has provided mechanistic insights in to how exosome signalling is regulated by stresses, such as nutrient depletion, to produce pro-tumorigenic effects. We anticipate that these studies may suggest new therapeutic targets that could be combined with existing treatments to improve patient outcome. Furthermore, by characterising the changes in the content of exosomes in response to different levels of mTORC1 and other stress signalling, our findings should suggest new diagnostic or prognostic tests that might be employed to assess cancer progression, determine responses to drugs, radiation or surgery, and stratify patients prior to treatment. We welcome enquiries and applications from researchers with different levels of experience, interested in joining our team. Figure 1. 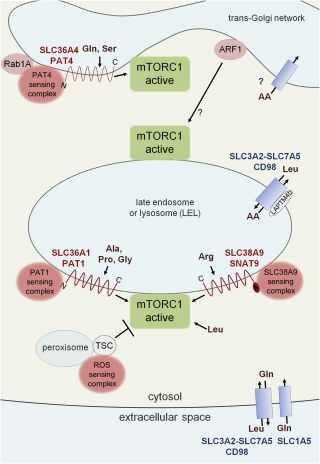 PAT and SNAT transporters regulate mTORC1 signalling from multiple intracellular compartments. Schematic model in which PAT (SLC36) and SNAT (SLC38A9) amino acid transporters (red wavy lines) act as integral components of different amino acid sensing complexes (pink discs). These transporters are thought to act as amino acid-stimulated receptors or ‘transceptors’, each responding to specific amino acids within their respective compartments, to regulate specific mTORC1 hubs (green). PAT1 (SLC36A1) and SLC38A9 (SNAT9) are associated with late endosomes and lysosomes and PAT4 (SLC36A4) the Golgi apparatus. Other amino acid transporters (blue rectangles) are presumed to act as conduits for amino acids required for growth. Figure taken from Goberdhan et al. (2016) Amino Acid Sensing by mTORC1: Intracellular Transporters Mark the Spot. Cell Metabolism 23, 580-589. Figure 2. Exosomes have emerged as intercellular mediators of cancer progression. Schematic of exosome signalling between cells leading to cancer progression. 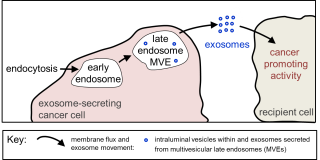 Exosomes are nanovesicles, about 40 - 140 nm in diameter, commonly believed to be produced by the inward budding of the limiting membrane of late endosomal multivesicular endosomes (MVEs) to form intraluminal vesicles, which are secreted as exosomes when MVEs fuse with the plasma membrane. Exosomes are thought to be released by most cells in humans, to circulate around the body and to be taken up by specific recipient cells. A rapidly growing body of evidence suggests that exosomes are associated with cancer growth and progression. More information on how the Goberdhan Research Group engage with the public.